Are you currently in the process of designing your new kitchen? The kitchen is a centrepiece for most new homes, open plan and constantly on show, its important you pay careful attention to the design of your kitchen. Discover these latest kitchen trends to help inspire the perfect hub for the family and entertaining friends. Wainscot cabinets are a traditional style that was popular during the colonial period in the United States. Now, they are becoming increasingly popular and look good in all areas of the home. It gives the illusion of incorporated raised panels by bevelling the edges of the panels used. Wainscot cabinets are now a modern trend inspired by a classic design that look great in country kitchens. Beautiful floral arrangements, large leafy greens and plants bring life to your kitchen space and are currently very prevalent in home décor. Adding plants to the kitchen is great way to bring the outdoors inside and add an organic touch to your kitchen space. Marble was a big hit last year with home design and decor. We saw beautiful benchtops, splashbacks, candles, clocks, coffee tables and pretty much everything else! Refined marble is still a hot-ticket item as far as kitchen trends go. Look out for a bit more of an organic coloured and veined stone look with onyx and granite starting to make their way into our spaces this year. The trend for ‘less is more’ is very popular when it comes to selecting a range hood. 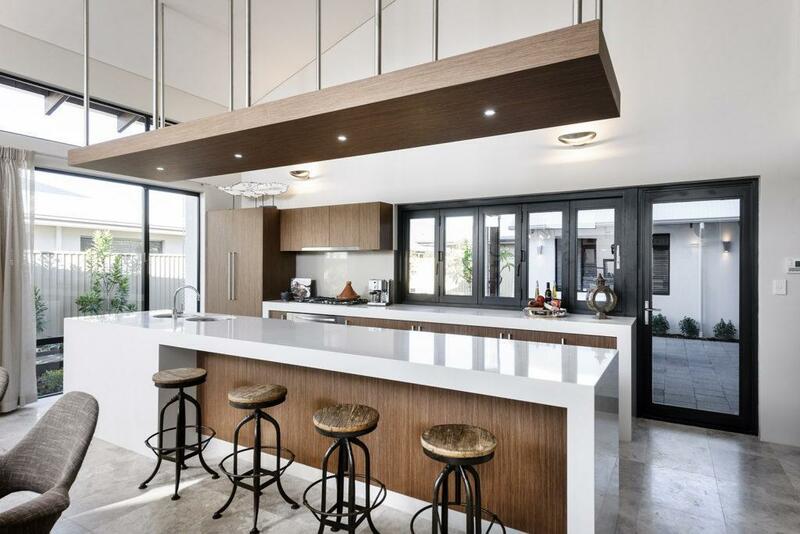 While some go for big, standout range hoods that take centre stage in the kitchen, it appears interior designers are choosing the opposite. Undermount range hoods are integrated into the kitchen cupboards and are hidden away from sight, looking aesthetically pleasing! Shiplap is the grooved timber panelling that has been very on trend for the past couple of years. Painted shiplap brings a hint of character to the kitchen; it can add loads of charm to a blank surface you may have in the room. Another trend following this is the return of simple, raw materials. Untreated wood, concrete and plywood are subdued finishes that we love seeing. These simple finishes are perfect in a practical kitchen that needs that something extra to make it special. We are in love with the built-in-breakfast banquette! It’s a fun way to dine in the kitchen and is very popular amongst young families. Banquettes/ kitchen nooks create a cosy and intimate space for the family to participate in activities such as doing homework, using a laptop or playing games. The colour forecast this year sees a lot of bold pinks, blues and browns. White on white has been popular for some time but perhaps its time to brighten things up in the kitchen. Perhaps a lush green on the walls of your open cooking zone or bright coloured seats, colour-bombing your life is sure to bring happiness into the room. Two-toned wall or pastel hits also work well in the kitchen. If you are going to use striking colours in this room make sure you balance it out with softer shades and subtle tones as well. On this note, Grey is being hailed as the staple colour for modern kitchens. Shades of grey can be incorporated into kitchens in a number of ways, such as through the use of floors or as paint colour. Grey is a slightly more daring to the standard white and can be easily paired with other products/styles. Keep your palette simple (grey fixed elements such as benchtops/splashbacks) and then layer with tangible colours. 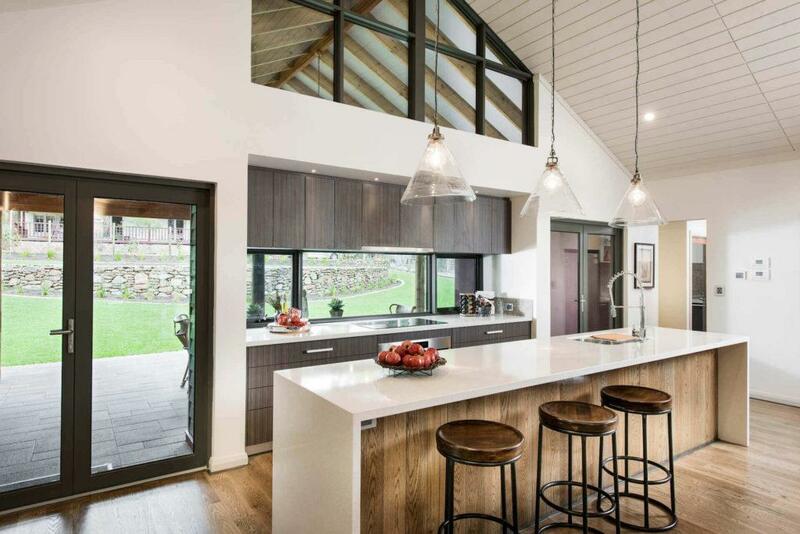 The glossy kitchen was once a very popular choice for new homes, however we are slowly seeing this being replaced with more natural designs of matt finishes, particularly on kitchen benchtops. Matt is soft to touch and less reflective, this style is currently very strong in the design industry. All-black kitchens, in particular, lend themselves well to the use of matt finishes and are picked to be a big trend in 2018. Thinking of incorporating the matt black in your next kitchen? Use it on kitchen cupboards or benchtops, for that modern, high-quality look.